Q. How have Microsoft Office certifications changed? A. Instead of using different certification names for different versions of Microsoft Office programs and Windows desktop operating systems, we have updated all of the Microsoft Office certifications to have the same name—Microsoft Office Specialist (MOS). This applies to all certifications for Microsoft Office versions, including Microsoft Office 2000, Office XP, Office 2003, the 2007 Microsoft Office System, and Microsoft Office 2010. It also applies to all Windows desktop operating system certifications for Windows Vista and Windows 7. 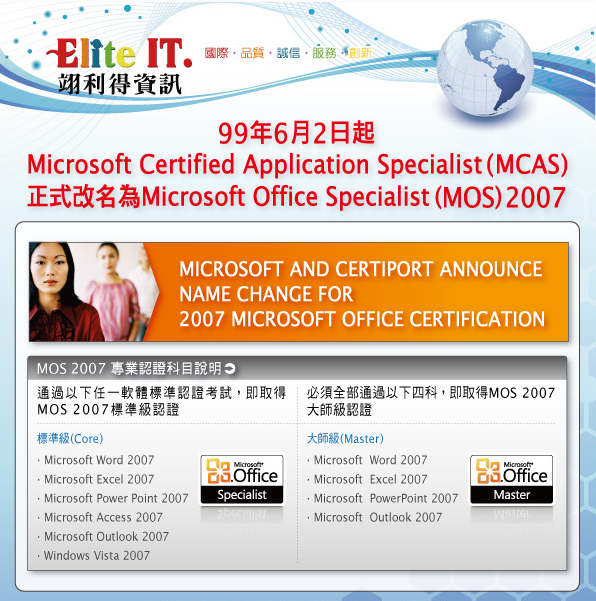 The certifications for the 2007 Microsoft Office System are no longer referred to as Microsoft Certified Application Specialist (MCAS) certifications. Using the more recognizable MOS certification name can help you gain more recognition from employers.